Colourful, isn’t it? A giant serving of soup, noodles, and vegetables a day keeps the doctor away! Okay, so maybe not every day, but every once in awhile a meal like this makes you feel so good from head to toe, inside and out. After feeling achy, flaming, and under the weather midweek several days ago, I decided that I need something warm and wholesome, something that would taste delicious and soothe me right down to my fingertips and toes. I didn’t want anything heavy (the thought alone made me queasy), but I still wanted something flavourful and punchy to take away that icky feeling in my throat and mouth. 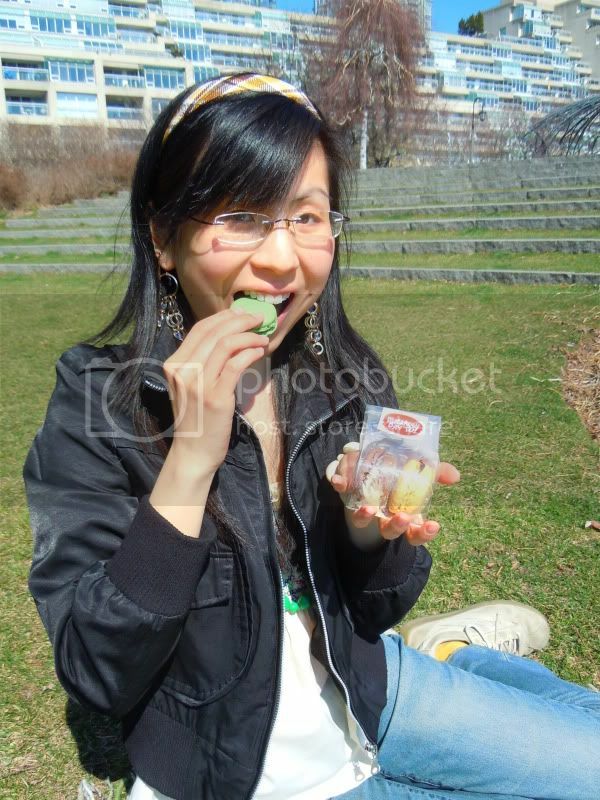 Staying home wasn’t an option so I went out and enjoyed some fresh air and had myself some Freshii! I had a mad craving for soup and thought, “Freshii has soup and I can finally try their rice noodles and stuff myself silly with vegetables until I roll down the street!” That was the plan and I stuck to it. Except the rolling down the street part. I was like a little water balloon by the end of it, but I managed to stay upright for the rest of the day. Every time I go to Freshii, a huge part of me always feels compelled to order the rice bowls because I love them so much. I have to force myself to get out of that comfort zone to enjoy their other menu items and I did when I tried their special Mango Tango Burrito months ago last year. I’ve always wanted to nosh on the rice noodles but the brown rice lover in me won out every time, so the rice noodles became a “I promise I’ll get to it” type of meal. I finally made good on that promise last week when I came up with the perfect solution to my achies: pop two balloons with one pin by trying the noodles and soup at the same time! Geninus! And get my wholesome veggies in at the same time. Win-win all around. 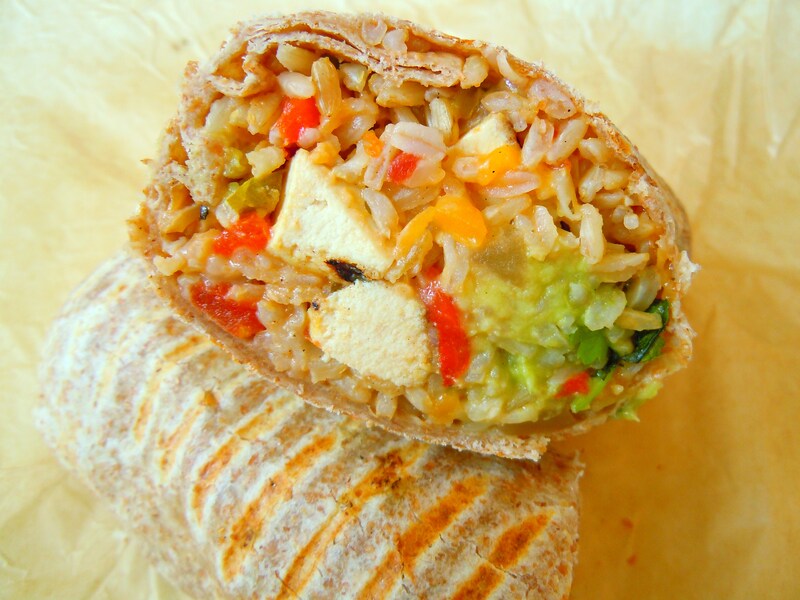 Getting My Mango and Tofu On – The Mango Tango Burrito at Freshii! I look a little silly cradling my burrito half like a baby, but when my food is yummy, I take great care in ensuring all of it ends up in my tummy as opposed to on the floor or on myself. Well, that, and because I just needed a way to get the burrito in the photo with me! I love burritos and I love how making them and eating them are one of the easiest and healthiest ways to get all my protein and veggies into a single meal. 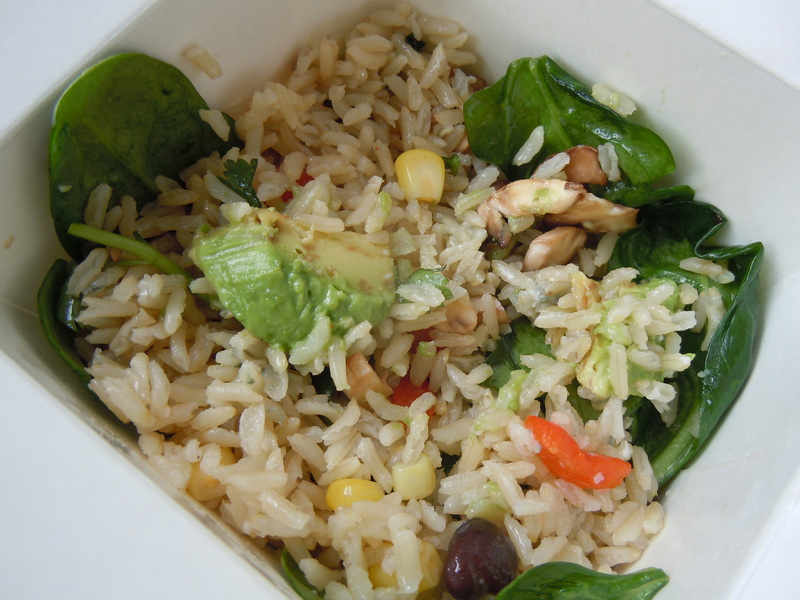 I’m crazy about rice and beans and stuffing things like chickpeas, avocado, peppers, cheese, and spinach into them. And don’t even get me started on the sauce! I mop up my sauces real good and a burrito just isn’t a burrito unless there’s guacamole, sour cream, or some other delectable dressing to dunk it in. 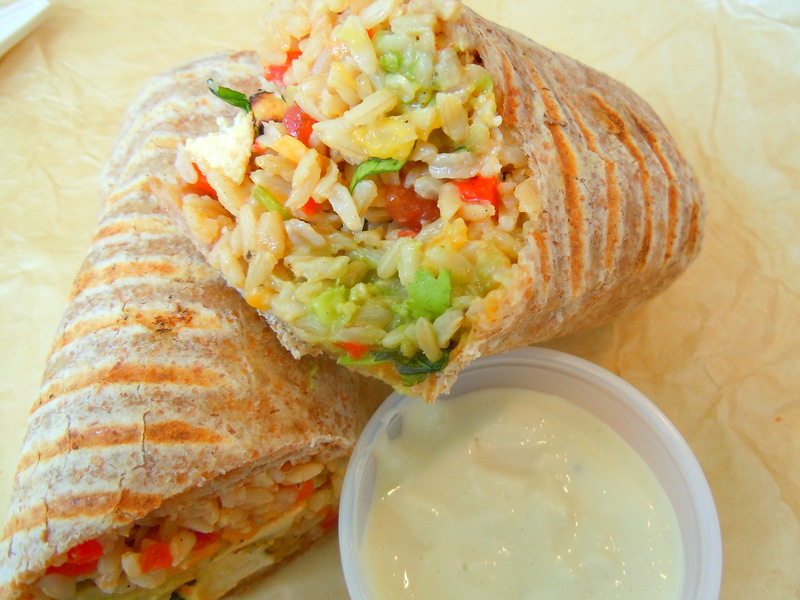 I’m a huuuge fan of the fish, shrimp, and veggie and bean burritos at Burrito Boyz, but haven’t really ventured out to other places around the city to try out others. I always want to, but there’s so many things I always want to eat that sometimes it goes on the backburner until I’m reminded of one and think, “hmm, that burrito looks scrumptious. I want to stick my face in it”. I wasn’t kidding though when I said I was afraid of soiling myself with my food; one of my earliest memories of eating tacos and burritos was unfortunately dropping rice and sauce on my dress at the age of 5. However, I have since replaced that exasperating experience with many happier ones, like the times when I would have build-a-burrito night for dinner at home and have bowls of chopped peppers, tomatoes, ground meat, rice, cheese at my disposable, and the heavenly meals at Burrito Boyz. 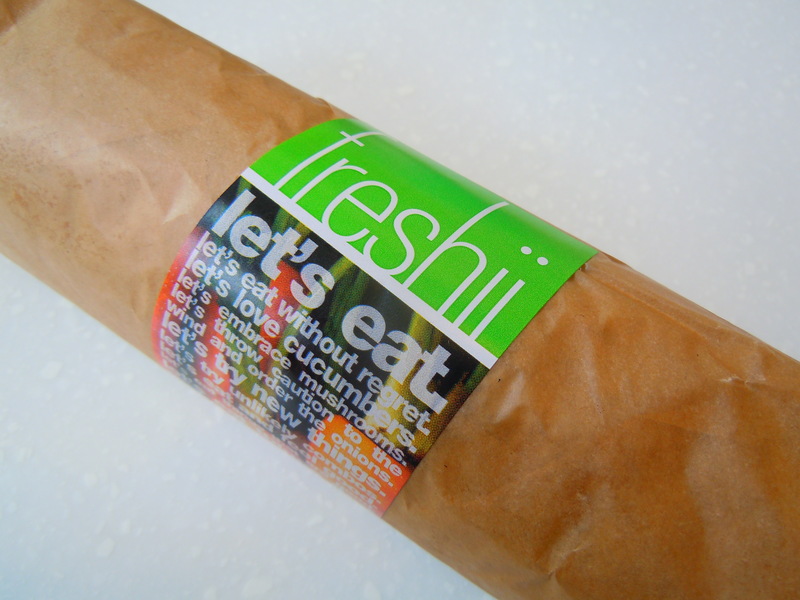 This burrito was the first item I tried from Freshii’s Social Menu (mains ranging from $7.29-$9.99), which debuted back in August at all Freshii locations and it was also the first time I tried one of Freshii’s burritos in general. After being seduced by brown rice Freshii bowls for over a year, it was time for a temporary change of scenery and lucky me, there was a special menu to work with! 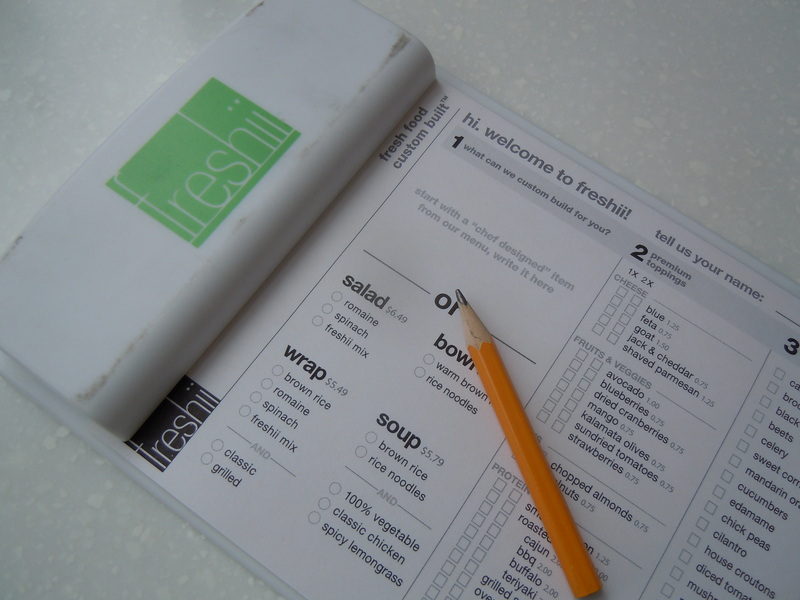 Freshii’s Social Menu was introduced over a month ago and the menu features a number of different combinations voted in and recommended by social media followers on sites such as Twitter and Facebook. This menu not only highlights what some of Freshii’s biggest fans love, but it also attests to the proliferation of social media as a tool for businesses to communicate with consumers, gauge likes and dislikes, reciprocate feedback, and to build relationships across borders. More and more, businesses are using social media outlets to promote their image and brand and to engage consumers in different ways. For example, Freshii has used Twitter to ask followers about menu items to add and to pass along promotions and news among other things. 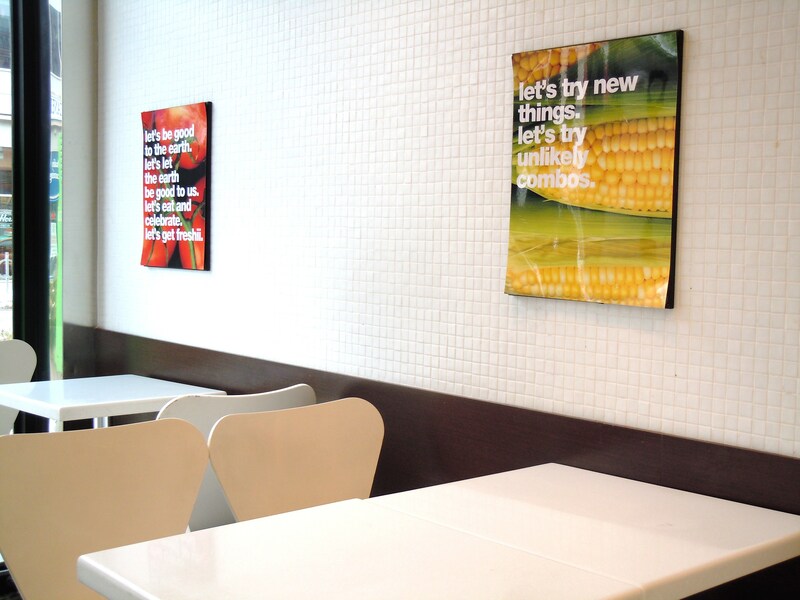 Freshii’s Social Menu thus reflects a very current and relatable mode of communication and creative process. 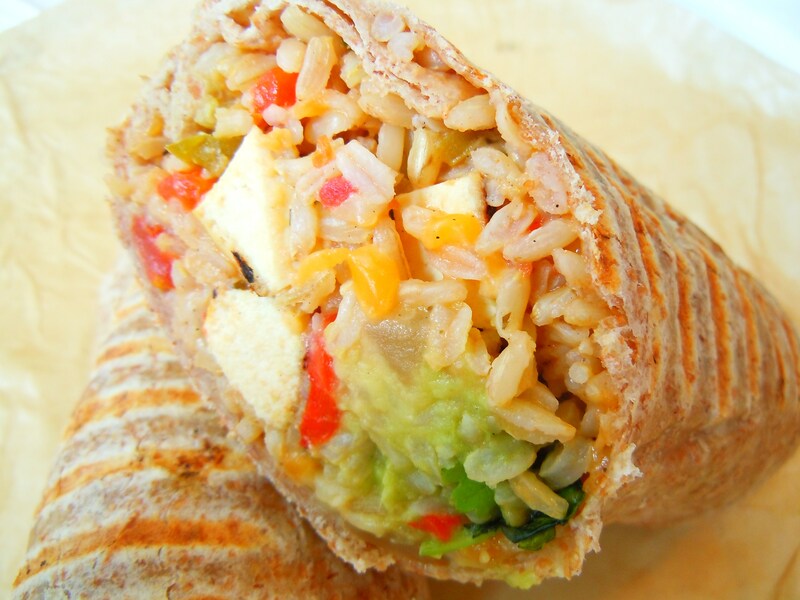 Freshii’s Mango Tango burrito had my name written all over it: brown rice with avocado, roasted red pepper, melted Jack and cheddar cheese, grilled tofu, and a mango, tomato, roasted red pepper, and cilantro salsa all wrapped in a grilled whole wheat tortilla. 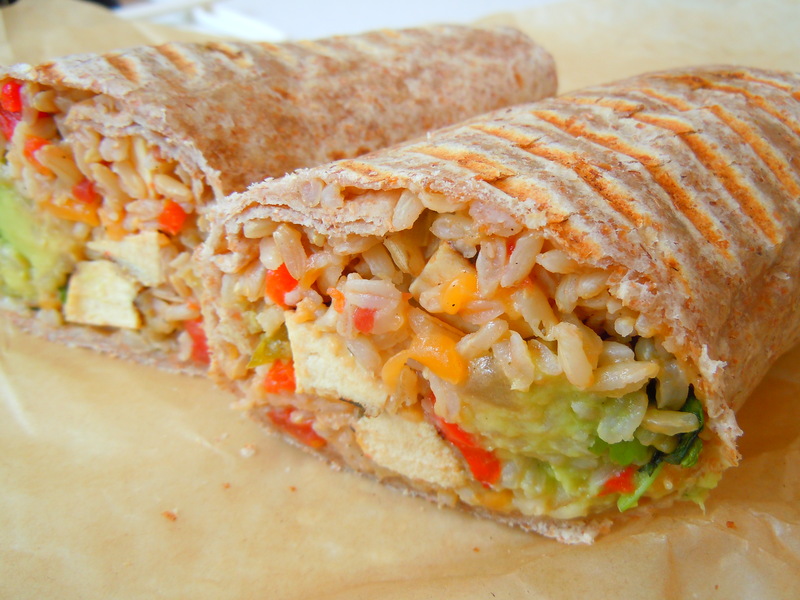 It goes without saying that I loved the combination of avocado, roasted peppers, and cheese, but what totally made this burrito a hit for me was the tofu! You’d think the tofu would be standing in the wings with a supporting role, but the tofu shined in this one. The tofu was cut into cubed chunks and it was so good because it didn’t taste rubbery and it had this great warm, nutty flavour to it. It added another dimension of taste and texture to the burrito and it was my favourite part of the whole thing. 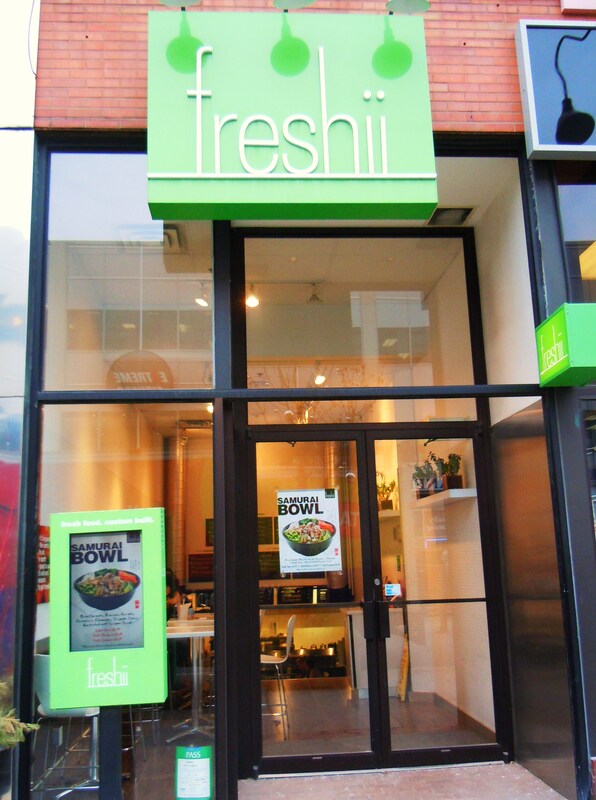 Freshii in Toronto serves 12 locations in the city with one also serving Mississauga. 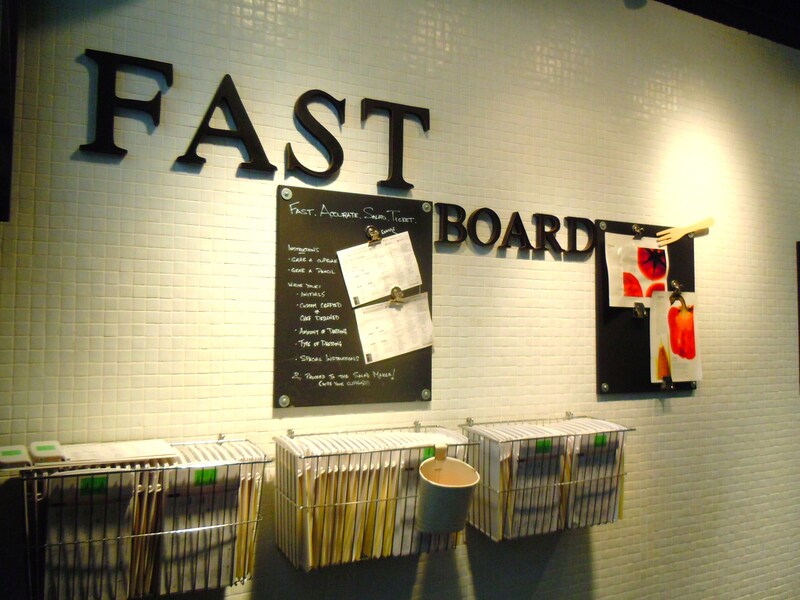 Click here for a list and map of specific locations, as well as more information on Freshii’s menu, goals, and mission statement. 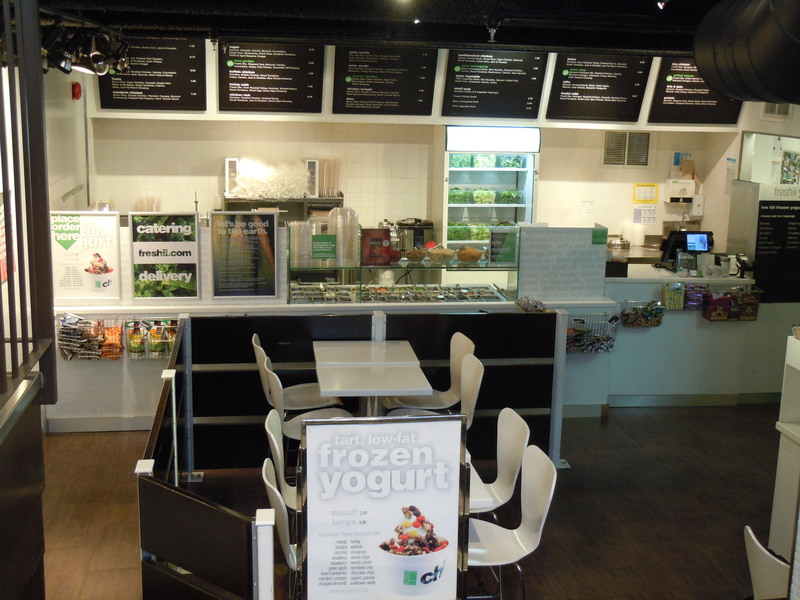 The Yonge and St.Clair Freshii is located at 1560 Yonge St., just north of St. Clair Ave. on the west side of Yonge. 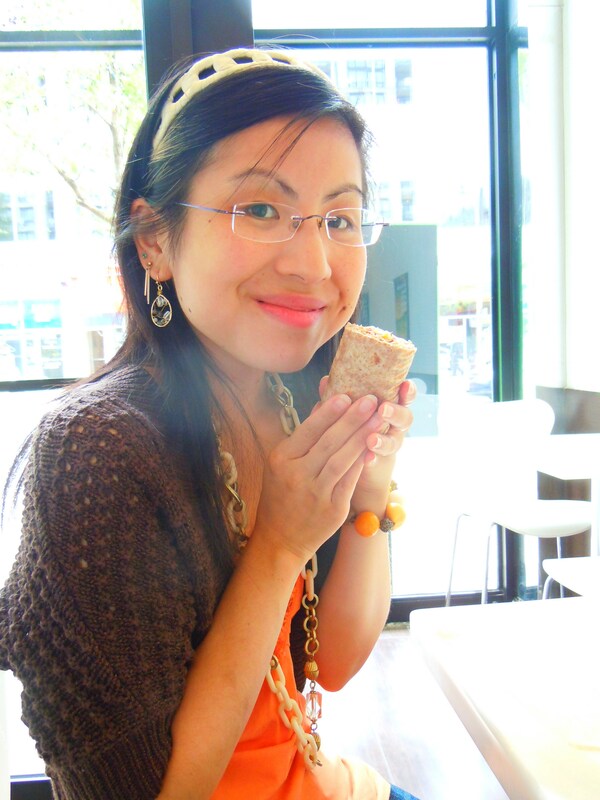 If you couldn’t tell by the scrapbooking and my love for adorable decor in foodie places, I LOVE working with themes! Themes get my creative juices flowing like crazy and it’s especially fun applying it to my meals! I think it’s really great when an eatery fills their own niche, has their own personality, and is cohesive in their decor and menu. Call me a food nerd, but when I look over a Freshii “menu” (the little white checklists attached to the cute little clipboards which you can view here), I start thinking of how I can put together a meal centered around a common theme and how I can make it really fun 😀 I look over all the toppings and ingredients and think, “Ooo, this would make a good ‘breakfast’ themed meal!” or “oh yum, if I put these ingredients together, it’ll taste like a Mediterranean pizza!” and “hey, I could make this into a Chinese take-out box!” I guess this is part of the fun in eating at Freshii, being able to truly customize a meal in whatever way you like. I feel excited when I come to eat here not just because I enjoy the food but because it’s almost like a creative outlet. And you know, creating a themed meal makes it that much more fun to scrapbook, ha. The theme for this meal was crunchy munchie! I thank my friend Maree for the inspiration for this term 😀 I know I can eat anything from salad to wraps to burritos to soup here, but I love the brown rice bowls so much that I’ve never deviated from this since I first ate here during the fall season of 2009. I know, shocking considering how much I harp on trying different things, right? I do want to eventually try their soup with rice noodles, but brown rice bowls at Freshii are one of the few things that I stick with on a consistent basis and I’m pretty content with that for the time being. I wanted to go full out with the flavour and the texture, so what I have here is a brown rice bowl with baby spinach, avocado, shredded jack & cheddar cheese, sliced mushrooms, chopped celery, corn, cilantro, edamame beans, chick peas, and sunflower seeds with yummy caesar dressing. The spinach, celery, chick peas, sunflower seeds, and edamame made me crunch-a-munch like crazy and I absolutely adored this combination. The combination of cheddar and caesar dressing made it flavourful and rich and the whole thing was just fun to eat! Your jaw might get a bit sore by the end of the meal, but I totally recommend this combination of ingredients and toppings! You never know if certain flavours will mesh well with one another (I’m hesitant about putting mandarin oranges with chicken, eh) but I’m glad that this meal turned out delicious. I think next time I’ll try out my Meditteranean pizza idea! 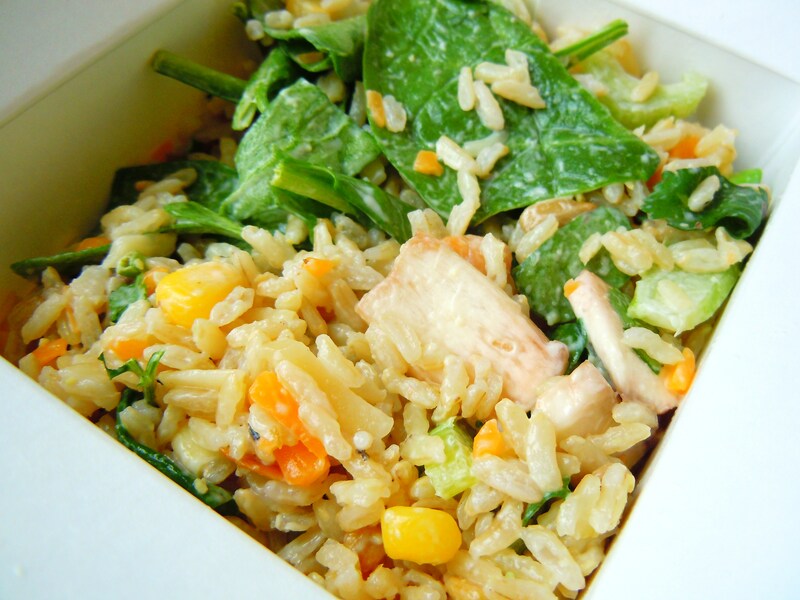 Freshii is also offering a Spring Fling menu for the season with special menu items like the santa fe salad, sprouter bowl, and buffalo chicken burrito. Click the link up top for more info on what’s in each of these menu items. If I can get around to it, I think might be interested in trying either the santa fe salad or the sprouter bowl. Happy crunchy munching everyone! 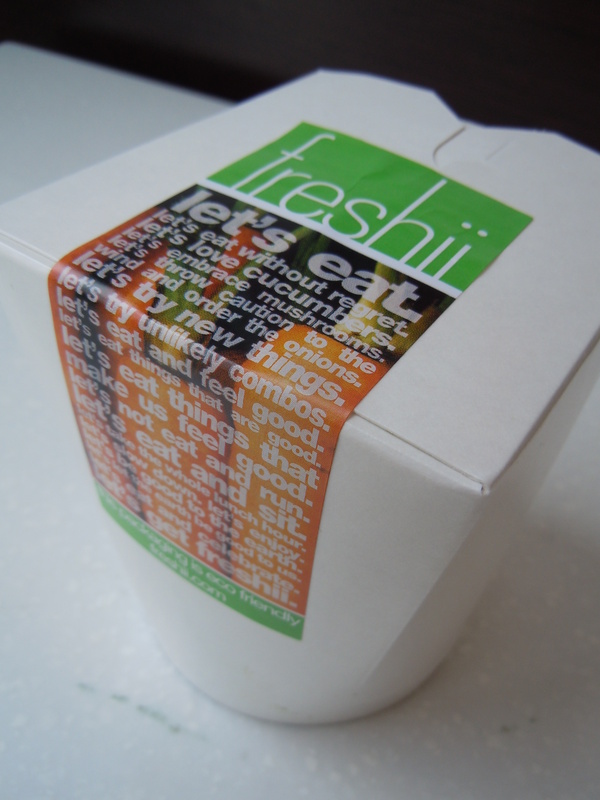 Freshii in Toronto serves 11 locations in the city with one also serving Mississauga. Click here for a list and map of specific locations, as well as more information on Freshii’s menu, goals, and mission statement. 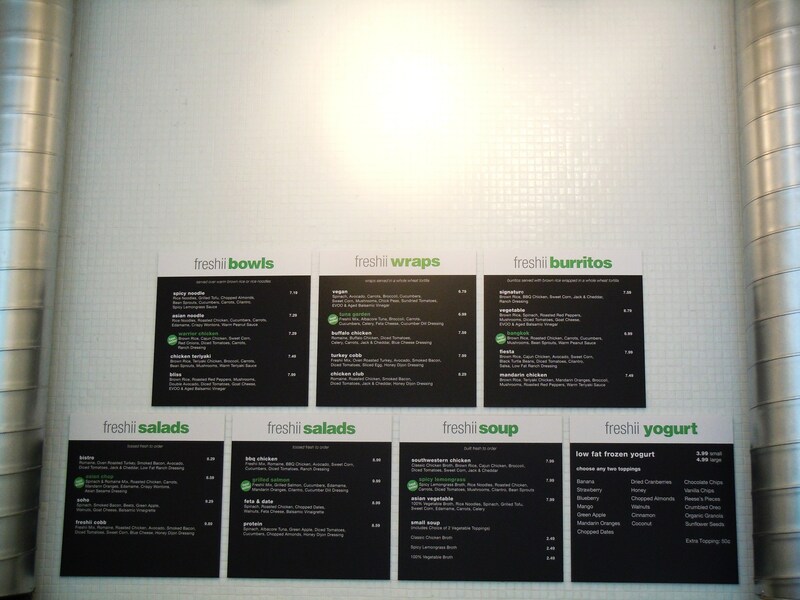 The Yonge and St.Clair Freshii is located at 1560 Yonge St., just north of St. Clair Ave. on the west side of Yonge. 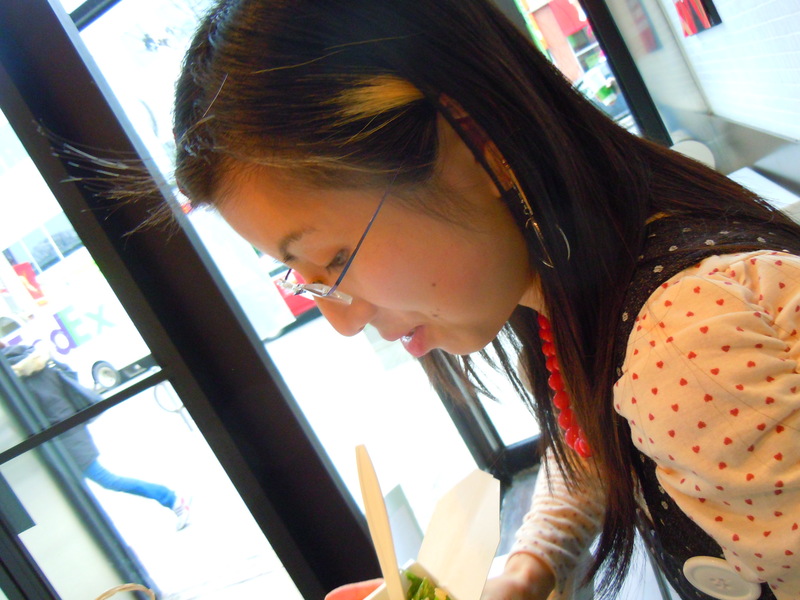 If you recognize this photo, it’s because I have it posted in my “For the Love of Food” page up on my menu bar 🙂 This photo was taken at my favourite Freshii restaurant location (Yonge St. and St. Clair) and it epitomizes everything I feel food should be about. Food is about enjoyment, relaxing, and nourishing every part of you and because of our hectic day-to-day lives, I don’t think we take that time for ourselves enough. You take things to go and rush off to your next appointment, you eat and work at the same time. 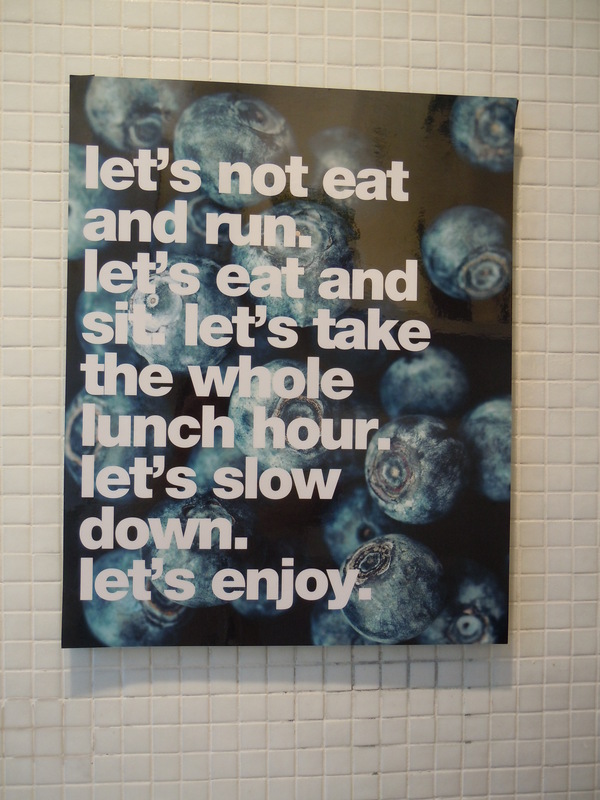 Heck, sometimes you may even skip a meal because you’re “too busy”. Freshii is fantastic in terms of options. 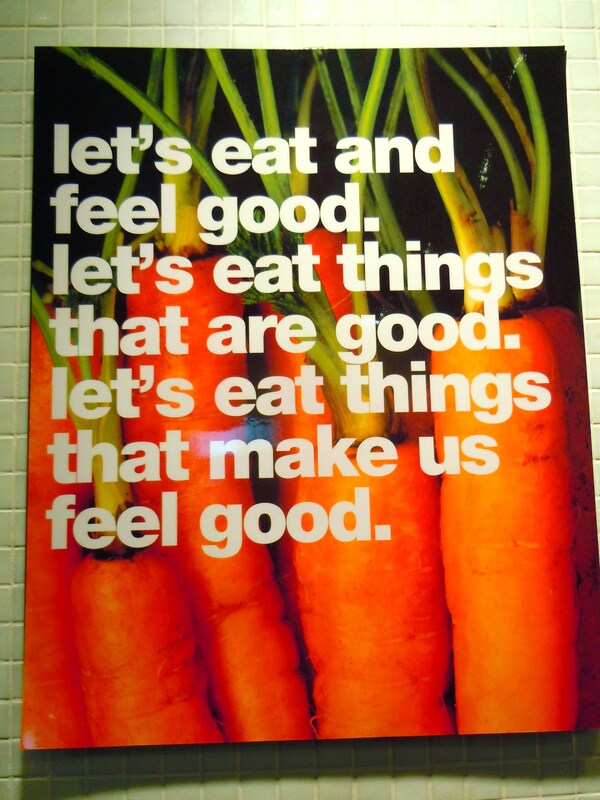 It’s wholesome good food that’s healthy and energizing. 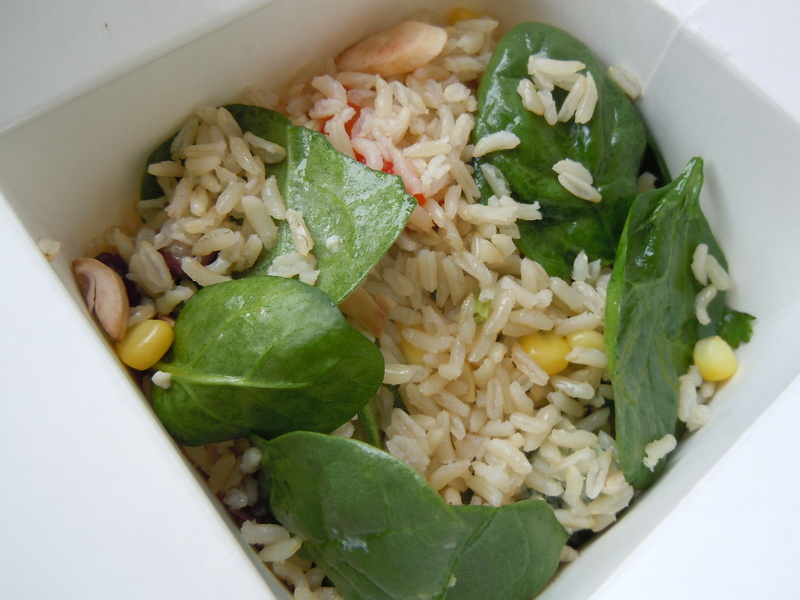 Think brown rice bowls, fresh mixed green salads (spinach, romaine, spring mix), soups in steaming chicken or lemongrass broth, burritos and wraps made with whole wheat tortillas, rice noodles, a gazillion fruits, vegetables, beans, and protein-rich add-ons for every meal, and frozen yogurt. Even though I marked Freshii as a “veggie eat”, rest assured for those of you who enjoy meat, there’s plenty of meat options here too! 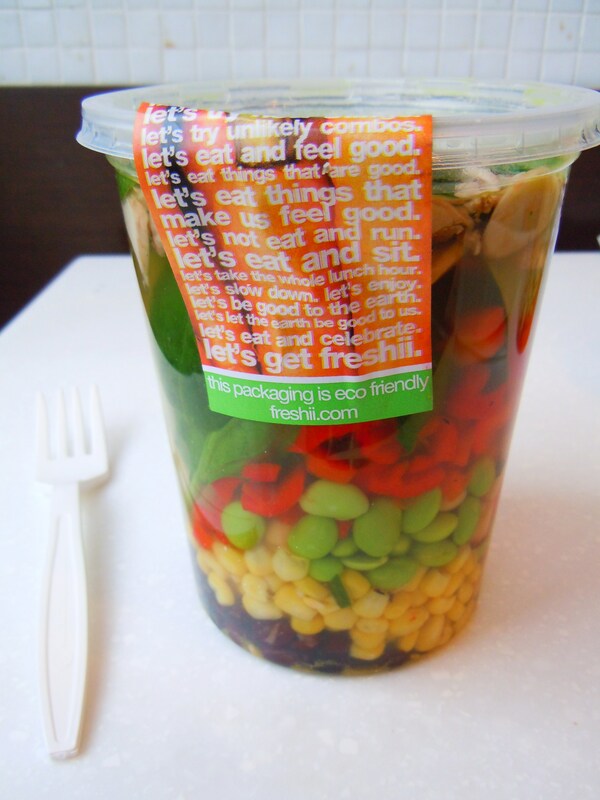 Freshii is all about customizing meals to fit your diet, your lifestyle, and your nutritional needs. 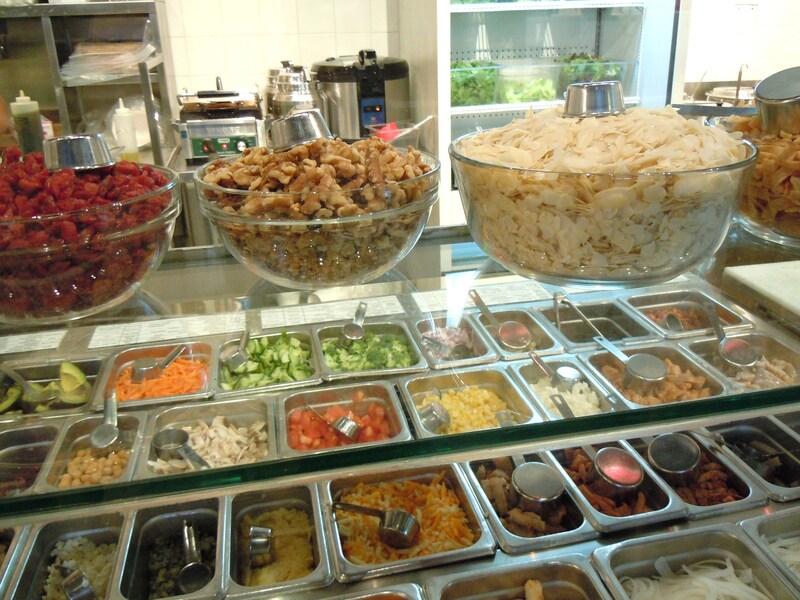 There are meals on the menu board for you to choose from, and you can also customize your meal by choosing a dish (for example, brown nice, salad, or soup) and checking off all the toppings and ingredients you want in it. And this is where the fun part comes in! 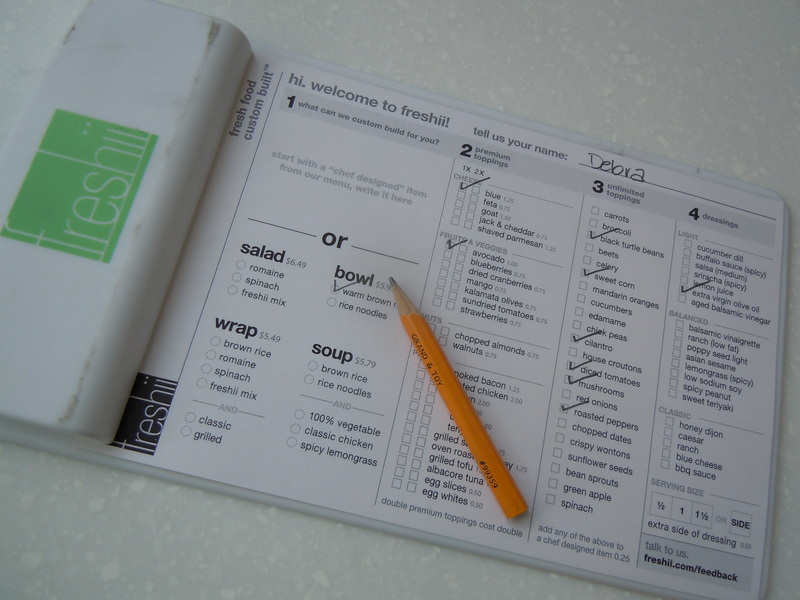 The mini clipboard with menu paper and pencil! Although I absolutely LOVE their “Bliss” bowl (brown rice with lots of yummilicious things which I will blog about another time), I also get so giddy creating my own meal, choosing all my own ingredients and toppings, and anticipating with glee how awesomely delicious it will be when it’s made. Basically, you start off with either a salad, a bowl, wrap/burrito, or soup at the starting price. Then you let yourself go NUTS with the ingredients! 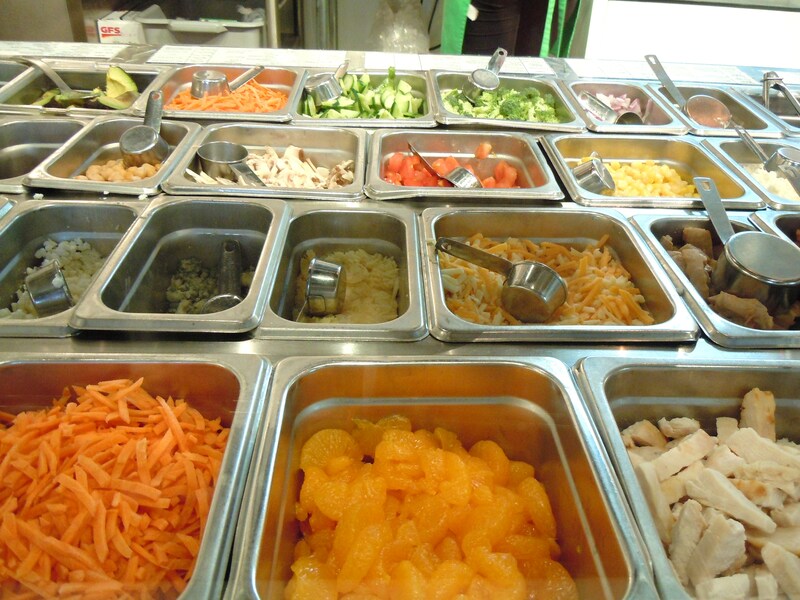 There is a very long list of fruits, vegetables, and beans that you can choose without any extra charge and then you go about deciding what kind of dressing or sauce you want (if applicable). If you want other options such as meat and cheeses or extra sauce and dressing, you just add the extra charge designated by those lists. Easy peasy! So, what did I choose for this time? Look below and you will see. I was in conniptions over how delicious this was! Not that I’ve ever eaten anything here that I haven’t loved, but I was just nom, nom, noming up the wall. I had myself a brown rice bowl with black beans, sweet corn, roasted red peppers, spinach (I replaced the tomatoes I had initially checked off; totally worth it), mushrooms, cilantro, added avocado and blue cheese, and had it all dressed in extra virgin olive oil. OH.MY.GOD. 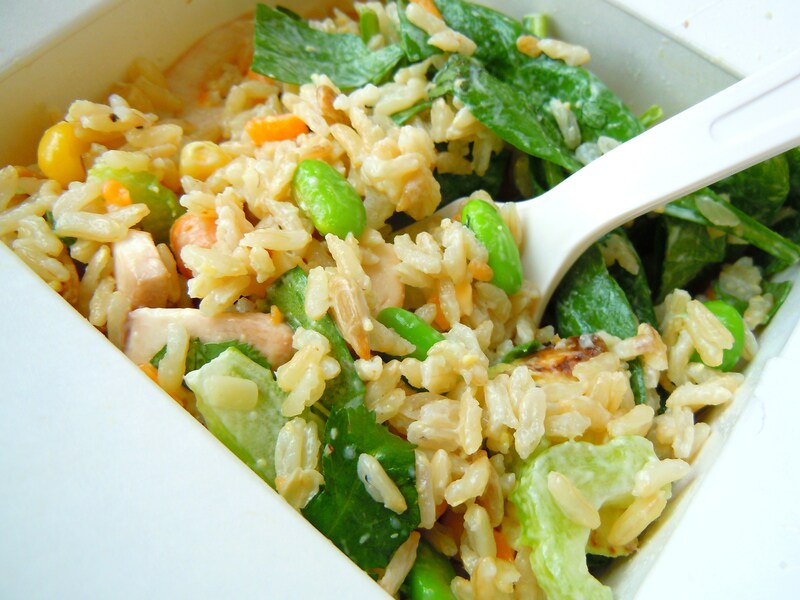 I scarfed this heavenly box of brown rice, veggies, beans, and cheese down faster than my boyfriend did. I was hungry, it was so yummy, and I felt SO GOOD after. The kind of good that makes you feel strong, energized, and ready to run a marathon. Okay, maybe not a marathon, but I certainly could have flown up several sets of stairs Rocky-style. 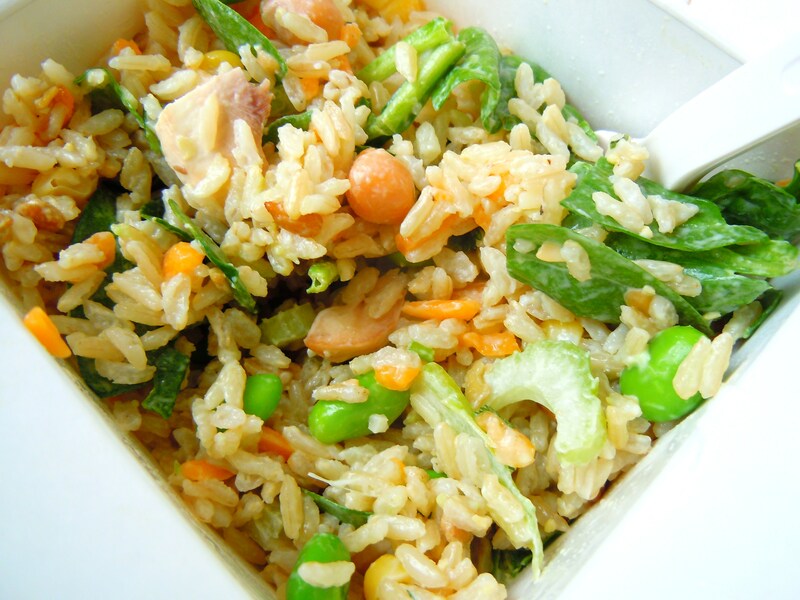 And it blows my mind because it’s rice and, if you’ll recall from Monday’s post about Mela, rice and pasta and starches are filling and they can unfortunately lead to sluggishness and overall discomfort during the day with digestion and all. Not with Mela and not with Freshii either. It lives up to its name. So fresh and so good. Whenever I eat at Freshii, I have such a sense of contentment. 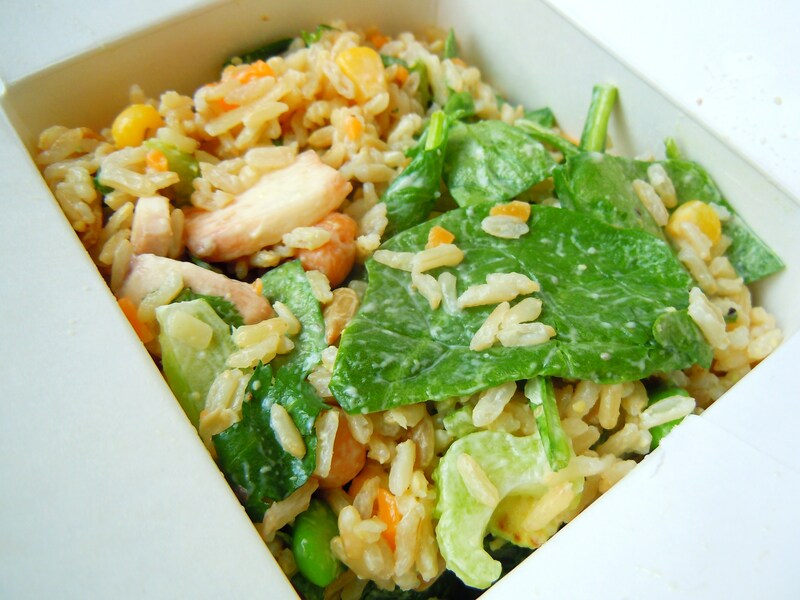 I sit down with my box of rice and enjoy my meal. No rush. No crowdedness. Not to knock other locations, but I’m telling you, the most enjoyable spot to eat is the St. Clair one. For one, there’s more than just a bench bar to eat at. For another, there are windows up at the front for nice sunlight to stream in (I’m not entirely fond of food courts and being stuffy indoors with lackluster lighting. And yes, this partially has to do with my pickiness about pictures!). It’s a great place to eat if you’re looking for healthy options that can be molded to your needs, and I’d say that most meals are under $10. If you go wild with things like cheese and meat, you’ll probably exceed that price point, but if you’re solely vegetarian or vegan, you can definitely do a meal for about $6 or $7.